(CNN) -- Unless you've got a stash of Forever Stamps sitting around, it might be time for a trip to the post office. The price of mailing a letter jumps 2 cents Monday. 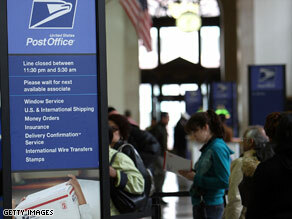 The Postal Service said the price increases were needed because of rising production costs. First-class mail will now cost 44 cents for the first ounce. Large envelopes cost twice that, 88 cents. Mailing a postcard will cost 28 cents. The Postal Service said the price increase, announced in February, is necessary because of rising production costs. Under law, the price of stamps is not allowed to rise faster than the U.S. consumer price index, which measures inflation. Forever Stamps allow customers to effectively circumvent price hikes. Sold for the rate of a first-class stamp, they can be used at any time for a one-ounce letter. The Post Office says it has sold billions since introducing the stamps two years ago.